Wine Country Theatre is showing Annapurna at the Park Street Ballroom through Oct. 8. Tickets range from $15 to $25. Visit winecountrytheatre.com for more information. "So, these two exes walk into an trailer ... ."
It's a daunting scenario, both to be a part of and to watch. But whether you're in it or on the outside looking in, it's impossible to not be drawn into the mix of tension, things left unsaid, and the love that still remains underneath it all. 20 YEARS LATER After leaving her husband Ulysses (Tom Ammon) in the middle of the night years ago, Emma (Jenny Shaheen) tracks him down in a trailer park in Colorado. It's also very, very uncomfortable, raw, and real. This is a gritty tale that Wine Country Theatre is currently showing at Paso Robles' Park Street Ballroom through the contemporary play Annapurna, written by Sharr White and directed by local Dana Shaheen (he and his wife, the show's co-star Jenny Shaheen, run Chameleon Productions in Arroyo Grande). The set is a thing to behold. The play takes place in a trailer park in the wilds of Colorado. However, we only see the inside of Ulysses' (Tom Ammon, seen locally in past productions at SLO Little Theatre, PCPA, and more) trailer. Imagine a trailer cut in half and plunked on the stage (with a nice peek at some mountains through the back window). The details built into the set seem limitless and perfect, from the overflowing bag of trash, to the combo shower/toilet, to the box of cheap swisher cigars. Before we are introduced to either of the actors, we are shown this empty trailer at night with the sounds of Cat Stevens singing and someone struggling to breathe in the background. It's simultaneously eerie, sad, and weirdly soothing. Once the location is established, White wastes no time getting to the meat of the story. 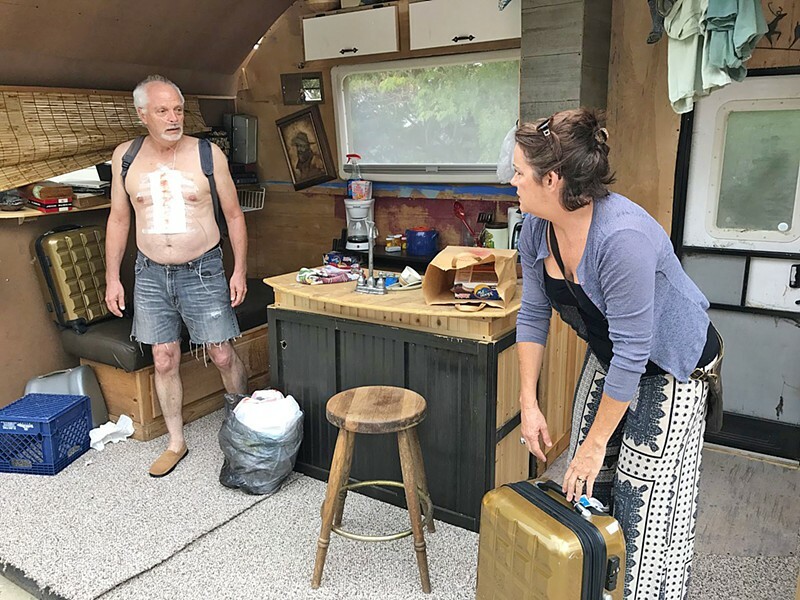 We barely see Ulysses bumbling around his trailer, wearing nothing but a short apron and a large bandage across his chest, when a woman with a suitcase comes charging in through the front door. The air is thick with shock as they stare at each other. Finally Ulysses breaks the silence and says, "Holy crap!" and the woman, simply says, "I know." It's soon revealed that the unannounced visitor is Emma (Jenny Shaheen), Ulysses' ex-wife, who left him 20 years ago in the middle of the night, taking their then 5-year-old-son with her. The play is essentially this: two actors in a room hashing things out. It's a setup that could go horribly wrong, but the raw energy and finely honed acting crafts of Shaheen and Ammon make for a tense and spellbinding journey. The impetus for Emma's visit is that she's left her second husband in a similar fashion to how she left Ulysses. She's come to Colorado because she's learned that her ex-husband has an illness that will kill him sooner rather than later. Meanwhile their 25-year-old son is on the way to Ulysses' home, looking for answers. Get some closure at rcooley@newtimesslo.com.